The wide variety of internal conflicts all over the world as well as the different intensity of fighting and gravity of internal turmoil make it almost impossible to provide an all-encompassing and comprehensive definition of civil war. Scholars and political scientists never agreed on a unitary definition and the term “civil war” is rarely mentioned in international affairs and international law. One possible definition was provided by James Fearon – renowned scholar at Stanford University – who explained civil war as a violent conflict within a country, generally fought amongst organized groups. Such groups aim at changing the existing government policies or at taking power. However, other academics believe that a non-international conflict can be considered a “civil war” only if the government of the concerned country is one of the two (or more) parties involved in the fighting, and if the number of casualties is over 1000. As mentioned, the term “civil war” is not used in international law nor does it appear in the Geneva Convention. Conversely, in international humanitarian law we find the concept of “non-international (or internal) armed conflict,” which is defined as a condition of violence caused by protracted armed confrontations between armed groups or between governmental forces and one or more armed groups. Defining “revolution” is just as complicated. In fact, revolutionaries and dissidents have always devoted time and energy discussing the nature and the ideals of the revolution; the “definition process” is not less long and complicated than the initiation of the revolution itself. One of the first scholars to analyze the concept of revolution was Aristotle. The Greek philosopher defined revolution as a fundamental change in the state organization or in the political power, which takes place in a short period of time and that entails a revolt of the population against the authority. According to Aristotle, a political revolution could lead to the modification of the existing constitution or could entirely overturn the political order, bringing about a drastic change of laws and constitutions. However, as in the case of the civil war, there can be various types of revolutions (i.e. communist revolutions, social revolutions, violent and non-violent revolutions, etc.). In general, revolutions bring about mass mobilization, regime change (not always), as well as social, economic and cultural change. Civil war and revolution are two different concepts that have been analyzed and explained in various ways by scholars and researchers. Although the terms refer to two distinct events, there are some similarities between them. Both can lead to important social, economic and cultural changes within a given country. In some cases, the two terms can be interchangeable – in particular because scholars and researchers cannot agree on the extent and scope of a civil war and because it is hard to individuate the “turning point” that transforms a revolution into a civil war. For instance, the Syrian conflict initiated in 2011 is now univocally defined as “civil war.” Yet, it did start as a revolutionary act against the oppressive behavior of the government. The escalation of the intensity of the fighting and the progressive involvement of international and regional actors clearly marked the transition between “revolution” and “civil war,” but this is not always the case. What is the Difference between Civil War and Revolution? Both civil war and revolution stem from a popular malcontent within a given country but, while the revolution is almost always directed against the current government, civil wars can be fought among different ethnic and religious factions, and might not be directly against the government or the governing minority. Some of the main differences between the two concepts are listed below. Violence and non-violence: as per definition, civil wars are violent. In fact, most scholars adhere to the 1000-casualties rule to define an internal conflict as “civil war.” Conversely, revolutions may be violent or non-violent (i.e. Gandhi peaceful protests). In some cases, the non-use of violence is the weapon employed by the masses to request a change in the current paradigm and to show the world the real face of the oppressors. The terms civil war and revolution refer to a changing phase within a given country. Although the two concepts may, at times, be interchangeable, there are some key differences that clearly distinguish one from the other. Building on the differences explored in the previous sections, further distinctive elements are analyzed in the table below. Length There is no fixed length for a civil war. Some may finish in few days or months while others can drag on for years – see the Syrian civil conflict, ongoing since 2011. Revolutions are generally shorter than civil wars. When their length increases, they might evolve into civil conflicts. Ending Civil wars can end in different ways. They might come to an end if one of the sides involved surrenders; they might be won by one of the parties; or they might be interrupted by external intervention. Revolutions – just as civil wars – can end in different ways. However, in most cases, revolutions end either when the masses have achieved their goal of overturning the existing political system or when the ruling forces forcibly defeat the opposing masses. Consequences The consequences of a civil war depend on the scope, length and ending of the conflict. Longer and more intense wars may cause the death of thousands of persons and the displacement of countless citizens whereas shorter conflicts may cause smaller numbers of casualties. Civil wars may also result in drastic changes in the political, economic and social scenario of a country. Revolutions bring about change. The main goal of revolutionaries is to change the status quo. Although some revolutions end up being shut down or simply fail, the revolutionary feeling is a powerful social cohesive that is likely to thrive even if the revolution does not achieve the hoped results. Civil wars and revolutions are broad concepts that revolve around the idea of social, economic and political changes within a country and that may entail a certain degree of violence. Although the two concepts may seem similar, there are key differences that cannot be overlooked. Understanding the differences between non-international armed conflict, civil war and revolution is particularly important, as the number of internal conflicts seems to be on the rise. Today, while the number of international and large-scale wars is very low, regional and internal instabilities are growing – and could have a trickle-down effect that should not be underestimated. Giulia Squadrin. "Difference Between Civil War and Revolution." DifferenceBetween.net. September 25, 2017 < http://www.differencebetween.net/miscellaneous/difference-between-civil-war-and-revolution/ >. Higher ideals like communism and socialism? What makes the higher ideals. Are you serious? Communist and socialist ideals are social ownership of the means of production; production for human need; social equality and the elimination of exploitation. Compare to private ownership; production for profit; class privilege and exploitative relationships. One might quibble about the word “higher,” but there is no doubt that socialism and communism are ideals that place the good of society above the good of the individual. One can also argue that those are not the best, or even desireable, ways of organizing society, or that most attempts to bring about these societies have failed. Yet, one cannot deny the idealism. The article doesn’t look into purely social and economic revolutions, such as the Industrial Revolution. Also, many revolutions, such as the Russian, Mexican, or Cuban Revolutions emphasize the continuing aspect of the revolution. And many civil wars do involve outside groups and even foreign governments, including the current conflict in Syria. More simply, a civil war is when two or more factions are fighting for control of a single, central government. A revolution is when one or more factions are fighting to replace the ruling regime. The American War Between the States was neither. Like the American War of Secession from the British Empire, it was fought to dissolve the political bonds between two groups of people. Seems to me that the best, simplest answer to the difference between a Civil War and a Revolution is that a Civil War is factions of the ruling elite in opposition for control of the established government, and a war of Revolution is when the common populace of either faction go against the ruling elite. Both seek to supplant the dominant paradigm with their own ideology, but the difference is at what level. 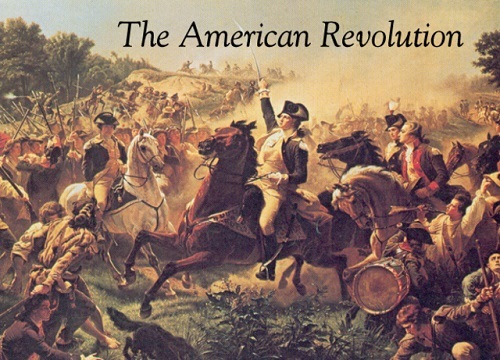 The American Revolution was the non-ruling, but wealthy Americans, who considered themselves British until that point, throwing off the oppression of King George’s tyrannical policies to become self-governing, thereby separating themselves from Britain. 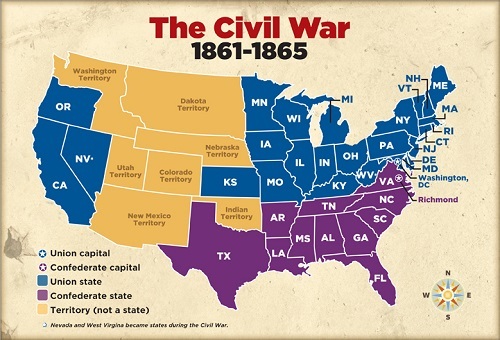 The American Civil War differed in that the elected ruling elite of the states that became the Confederacy were, until secession, part of the ruling elite of the United States. That they were attempting to schism off to become their own nation, does not change that this was taken from a group that was already part of the ruling class, not from outside it, as happens in a Revolution. As for those pointing to things like the Industrial Revolution, where the Revolution was of a purely technical and economic nature, these are not a combat against, or between, the ruling elite. No great societal overthrow was required. It was a massive change in how mostly manufacturing businesses were operated. This spread out to cause great social change. Gandhi’s non-violent Revolution in India was no less a Revolution than the US or French Revolutions, but the manner in which he “fought” his battles was VASTLY different. That his tactics and strategy differed in no way lessens that he was just as eager as our Founding Fathers to free themselves of an oppressive British influence. The block at the end of the article seems to be including some of the basic confusion of the difference in them. The Syrian conflict seems to have started as a revolution, but outside influences from other nations have propped up Assad on one side and a “civil” government on the other, into more of a Civil War now. Either way, win or lose, Civil Wars and Revolutions will bring great change, change that is not always beneficial to all involved. Cullen, Anthony. The concept of non-international armed conflict in international humanitarian law. Vol. 66. Cambridge University Press, 2010. Davies, James C. "The circumstances and causes of revolution: a review." Journal of Conflict Resolution 11.2 (1967): 247-257. Fearon, James D., and David D. Laitin. "Ethnicity, insurgency, and civil war." American political science review 97.1 (2003): 75-90. Fearon, James D., Kimuli Kasara, and David D. Laitin. "Ethnic minority rule and civil war onset." American Political science review 101.1 (2007): 187-193. Goldstone, Jack A. Revolutions: A very short introduction. Oxford University Press, 2014. Kraminick, Isaac. "Reflections on revolution: Definition and explanation in recent scholarship." History and Theory 11.1 (1972): 26-63. Rowe, C. J., Ellen Meiksins Wood, and N. Wood. "Class ideology and ancient political theory: Socrates, Plato, and Aristotle in social context." (1978).